swissmiss is a design blog and studio run by Tina Roth Eisenberg, a 'swiss designer gone NYC'. 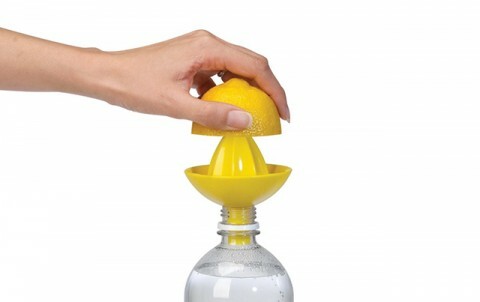 The Sombrero Juicer by Umbra lets you easily add a splash of citrus to your beverage. Simply place the juicer into the top of your beverage container and quickly juice a lemon or lime right into your drink. Definitely something I can live without but I admit, it made me look. Love its simplicity and usability, seriously! Ah these little things are nice. The kind of thing you wouldn’t really spontaneously think to buy though. Swissmiss is a design blog run by Tina Roth Eisenberg. Besides swissmiss, she founded and runs Tattly, CreativeMornings , TeuxDeux and her Brooklyn based co-working space Friends (formerly Studiomates). Interested in sponsoring a week of my RSS Feed? Click here to learn more. Thank you for subscribing to our daily updates. We promise not to use your e-mail address for any other reason. You can unsubscribe at any time. Site designed by swissmiss and developed by fabulous John Ford. Copyright © 2005–2019 Tina Roth Eisenberg, unless otherwise noted.